Tennis superstar Martina Navratilova says the “watershed” moment for gay people in sport has been reached – and she’s hoping for an avalanche. The lesbian tennis legend has written a piece for Sports Illustrated in which she commends basketball star Jason Collins for his coming out and how he has paved the way for future generations in sport. When the Brooklyn Nets player came out in 2013, he was the first active male athlete to do so from the four major North American professional teams. Since retiring, he has dedicated much of his time to campaigning on LGBT issues in sport. Navratilova wrote of Collins “he is the proverbial game-changer. One of the last bastions of homophobia has been challenged”. She added: “Collins’ action will save lives. This is no exaggeration: Fully one third of suicides among teenagers occur because of their sexuality. The player also mentions the group Athlete Ally, of which she is a member along with a growing number of gay and straight athletes who are tackling the deep rooted nature of homophobia and transphobia in sports by joining forces to raise awareness through campaigns and educational programming. The organisation has even teamed up with Ralph Lauren’s label to further raise awareness, with A list celebrities such as Uma Thurman, Robert De Niro and Alan Cummings all showing their support. This level of support and visibility will help “Millions of kids will see that it is OK to be gay. No need for shame, no need for embarrassment, no need for hiding”. Navratilova writes about how in the past homophobia went unquestioned, how sports bosses and coaches would speak out against the LGBT community, referencing the case of Reggie white, who, in the 90s “appeared in a newspaper advertising campaign to persuade gays and lesbians that they could “cease” their homosexuality. The NFL responded with … a lot of silence”. Only last year NFL player Chris Kluwe wrote a controversial piece for Deadspin in which he reproached the industry for trying to ‘silence’ him on his support of gay rights. He also launched a lawsuit claiming his pro gay stance was the reason for being dropped from the Minnesota Vikings. But the game is changing, more and more stars are choosing to come out, from rugby’s Gareth Thomas to football’s Casey Stoney, support from straight and gay allies is helping to pave the way for sporting to be more inclusive. 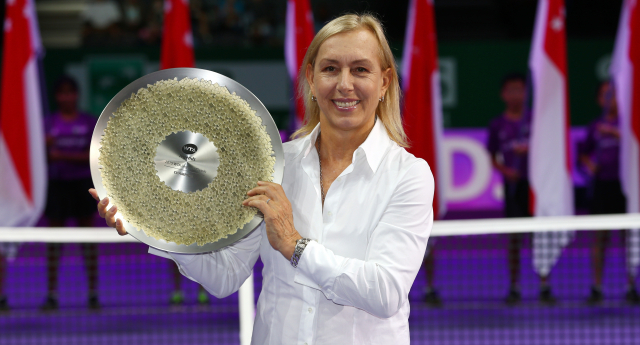 As Navratilova encourages: “Come out, come out wherever and whoever you are. It is beautiful out here and I guarantee you this: You will never, ever want to go back. You will only wonder why it took so long”.